Despite beginning their first Spring Training as pro baseball players earlier this month, Kevin Gowdy, Mickey Moniak, and Cole Stobbe, the Phillies' top three picks in last June's draft, have known each other for nearly two years. CLEARWATER, Fla. – On a warm summer day in Cary, N.C., two years ago, 17-year-old Mickey Moniak led off and started in center field for a team dubbed the ‘Brave’ in USA Baseball’s Tournament of Stars, a six-day event that brings the 100 best high school players together at the national team’s training complex. Batting cleanup that day for Moniak’s team: third baseman Cole Stobbe. Starting on the mound in front of Moniak and Stobbe: right-hander Kevin Gowdy. Moniak and Stobbe hit back-to-back in each of the next three games with the Brave, the third of those coming in the Gold Medal game, when they went a combined 3-for-6 with a double, a walk, four runs scored, and two RBI. Gowdy pitched three shutout innings. Two months later, when the 20-man roster for the 2015 USA Baseball’s 18U National Team was announced, all three players had made the cut. A few weeks later, after training in Fullerton, Calif., they were taking on the best prep national teams in the world in Taipei, Taiwan and then Osaka, Japan, too. Nearly a year from the day they first took the field together – 352 days, to be exact – the trio of prep prospects was reunited and ready to put on the same pro uniform again. 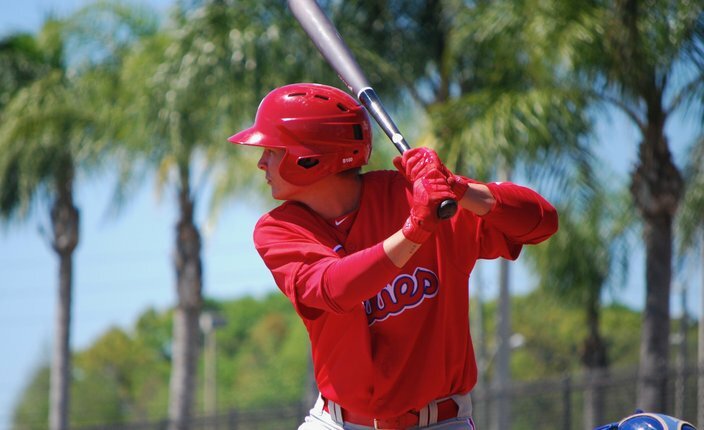 On the same June night the Phillies selected Moniak with the first-overall pick of the 2016 MLB Draft, they took Gowdy with their second-round pick (42nd overall). Less than 24 hours later, with their third-round pick (78th overall), they chose Stobbe. “Just nuts,” said the now-18-year-old Moniak. Mickey Moniak prepares to take a cut during a minor league spring training game in Clearwater, Fla. The three teenagers, who helped USA Baseball’s 18U National Team to a world championship over Japan in Osaka, Japan, 18 months ago, are now a part of the breakfast club of players checking into minor league camp shortly after 6 a.m. each morning, before the sun rises in Clearwater and when the lights of the four fields behind the Phillies Spring Training ballpark greet early arrivals to the Carpenter Complex in March. 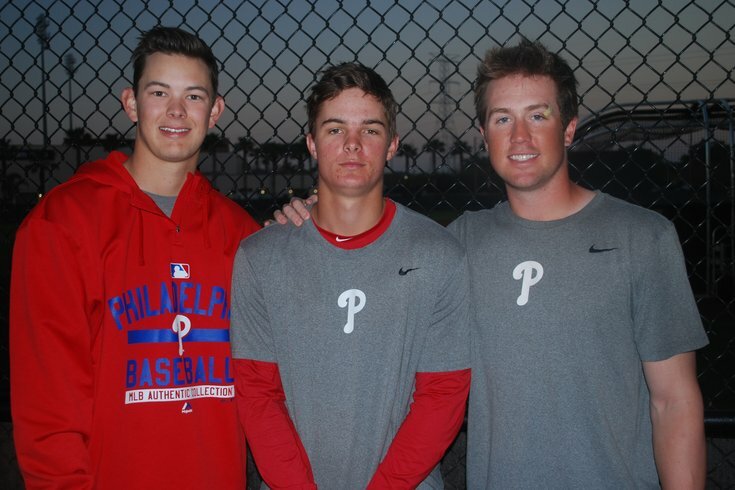 Less than two weeks after the draft, Moniak agreed to his first professional contract, which allowed the Phillies to sign Gowdy and Stobbe, too, and before the end of June, nearly a year to the day that they first met in Cary, N.C., the trio got back together in Clearwater, Fla., to begin the next stage of their baseball careers. Back in June of 2015, when they first met at the Tournament of Stars, the San Diego-area native Moniak and Stobbe, an Omaha, Neb., native, stayed with the same host family in North Carolina. They became fast friends and, with the draft a year away, decided to make a pact. “We said if we get drafted by the same team, I don’t care where you go, you’ve got to sign, no matter what,” Moniak said. Moniak had a verbal commitment to UCLA (as did Gowdy) while Stobbe was committed to Arkansas. Their pinky swear-like agreement could have turned awkward if, say, Moniak was selected in the first round but Stobbe stumbled out of the first several rounds because teams feared he might not sign, and instead, honored his college commitment. But that didn’t happen. Instead, the Phillies were able to play a draft without a consensus No.1 pick the way some suspected they might, spreading their $13.4 million slot money over their top 10 picks, enabling them to nab Gowdy (a potential first-round arm) and Stobbe by paying them over slot value. During the first two days of the draft, none of the former Team USA 18U teammates had any inkling that being reunited with one team was a possibility. Predicting the future career track of prospects is tricky, particularly when they are teenagers less than a year removed from the draft. But the Phillies obviously see promise in Moniak, Gowdy, and Stobbe and can only hope they’ll follow the path of the J.P. Crawford, Dylan Cozens, and Roman Quinn, keeping the flow of homegrown talent churning continually through their system and onto the big league roster in the coming years. No matter big market or small, the safest way to have sustained success is to have a farm system that’s consistently producing major league talent. 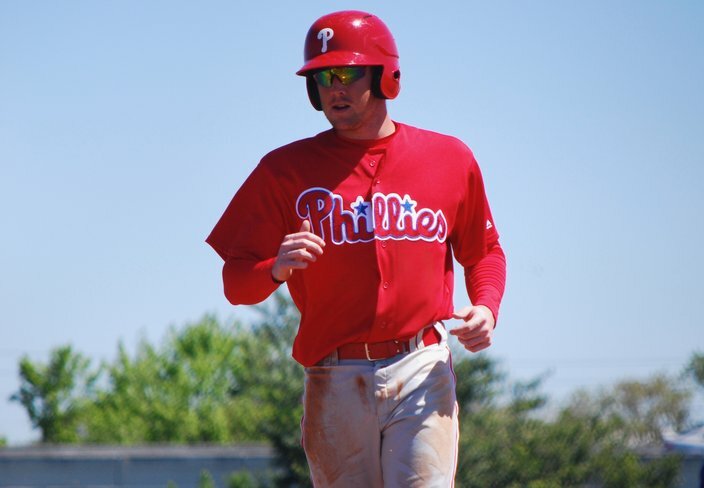 Again, it’s far too early to forecast when that day may come for 2016 draftees, but the Phillies trio was at least able to get their pro careers going late last June with the organization’s Gulf Coast League team in Clearwater, where highly-regarded international prospects Jhailyn Ortiz and Sixto Sanchez also played last summer. Third base prospect Cole Stobbe, the Phillies' third-round pick in 2016, met first-round pick Mickey Moniak and second-round pick Kevin Gowdy a year before the draft as teammates for USA Baseball's 18U team. It’s uncertain if Moniak, Gowdy, and Stobbe, the top three selections from last year’s draft, will play together in 2017. Moniak is likely destined for Low-A Lakewood to start the season while Gowdy could stay behind in extended Spring Training (which wouldn't be uncommon for a recently-drafted high school pitcher). But the experiences they’ve had in each of the last two summers, literally traveling the world together as budding teenage prospects and reuniting in their first days of professional ball, have made the transition from high school kids to minor league players, living hundreds of miles away from home, almost seamless.